Background: The aim of our study was to assess the delay of fibrinolysis in ST elevation myocardial infarction (STEMI) in our region and to identify characteristics associated with prolonged delay. Patients and Methods: We analyzed clinical characteristics of a prospective cohort of unselected patients admitted for (STEMI). The study was conducted over three years 2007-2009 and 250 patients were included in a single center without capability of percutaneous coronary intervention. Results: The mean age of our patients was 58±13, 7 years. Ninety percent of our patients consult directly the emergency department and 61, (5%) of them were admitted within first 6 hours of onset of symptoms. Median time to reperfusion was 46 min. Predictor of this long delay to initiate fibrinolysis were inter-department decision OR 6; 95% CI 3,48-10,34, diabetes OR 2,25; 95% CI 1,28-3,96 age >58,4 years OR 1,97; 95% CI 1,19-3,25 and transfer from regional hospital to our center OR 1,78; 95% 1,03-3.07. Conclusion: These results suggest that improvement in organization health care system can shorten delay to fibrinolysis in a center without percutaneous coronary intervention capability. It is well known that percutaneous coronary intervention (PCI) is superior to fibrinolysis for ST elevation myocardial infarction (STEMI), but fibrinolysis remains a good option for centers without PCI facility or geographical inaccessibility. Several trials have consistently shown no differences in mortality between primary PCI and thrombolysis when performed within 2 hours of symptom onset,  provided they can be transferred to PCI hospital for rescue or angiography in order to decide on final treatment of culprit lesion. The objective of this study was to assess the delay of fibrinolysis in STEMI in order to identify factors associated with prolonged delay. We conducted a prospective study between January 1, 2007 and December 30, 2009. Two hundred and fifty patients with STEMI were treated in the department of cardiology of Farhat Hached Hospital, which is one of the two teaching hospitals in Sousse, but without PCI capability. All cases included patients who consulted directly the emergency department or patients who were transferred from other peripheral hospital. Maximum distance from a peripheral hospital to our emergency department was 20 km. The following patients were excluded sequentially: patient who underwent primary PCI, patients who had contraindication to fibrinolysis, patients who had a delay from symptom onset to hospital arrival > 12 h.
Time to fibrinolysis was defined as time from the first diagnostic electrocardiogram for STEMI to thrombolytic administration. Inter-department decision was defined as the decision to give fibrinolysis when it was validated by a cardiologist and not by general practitioner in the emergency department. Statistical analysis: Univariate analysis was constructed to estimate the associations between delay of fibrinolysis for all patients and hospital characteristics. A P value of < 0.05 was considered statistically significant for all the tests and test of statistical significance were two-tailed. All analyses were performed using Statistical Package for the Social Science (SPSS) software version 17. 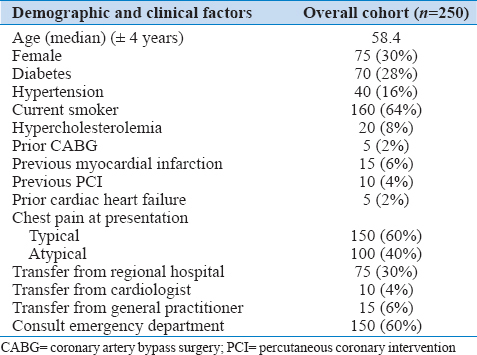 Overall characteristics of the patient cohort are reported in [Table 1]. Median time to reperfusion was 46 min. Seventy percent of patients were treated within 6 h of onset of symptom and 30% between 6 and 12 h from symptom onset to hospital presentation. For transferred patients, median time to reperfusion was 110 min. Only 15% were treated within 6 hours of onset of symptoms. Time to transfer from other centers differ from geographic situation, median time was 42 min. In univariate analysis, the factors most strongly associated with long delay to reperfusion treatment were transfer from regional hospital to our center, inter-department decision, age, and diabetes [Table 2]. After multivariate analysis, the association between reperfusion time and baseline characteristics remained largely unchanged, factors associated with long reperfusion time were inter-department decision OR 6; 95% CI 3,48-10,34, diabetes OR 2,25; 95% CI 1,28-3,96; age > 58,(± 4 years) OR 1,97; 95% CI 1,19-3,25; and transfer from regional hospital to our center OR 1,78; 95% 1,03-3.07. Compared to fibrinolytic therapy, PCI is the preferred initial reperfusion strategy for STEMI. In our region, despite the presence of three catheterization laboratories and a mobile intensive care unit system, patients still consulted directly the emergency department. Some studies have shown clearly that mortality was similar for patients treated with thrombolysis and routine subsequent invasive strategy compared with primary PCI, , and because the door to balloon times are often greater than 2 hours in our region, we preferred to use a pharmaco-invasive strategy which consist of starting fibrinolysis and then, transfer the patient to PCI center. In our study, reperfusion time was too late because of the delay of inter-department decision. Rajagopalan has found that visits to the general practitioner were an independent factor correlated to delay of reperfusion in patients with STEMI. General practitioners working in our emergency department prefer to ask a cardiologist's opinion before thrombolysis, and this may loose more time for the patient. In the last year, we have started an educational program to the physicians who are working in the emergency department to demystify the risk of fibrinolytic treatment and to facilitate fibrinolysis without the presence of the cardiologist and we hope that it will improve delay to reperfusion time in STEMI. We think that the reperfusion time in our emergency department doesn't represent the real time in our region because we have excluded patients who have pre-hospital fibrinolysis by mobile intensive care unit system. As a consequence, this may reduce reperfusion time in our region. The median time to reperfusion in our center was too long. This constitutes a problem to effective new therapies of AMI. It is therefore essential to reduce this delay. To achieve this objective, real effort should be made, to think about health organization between multidisciplinary teams especially emergency medicine and cardiologist. The reduction of reperfusion time in STEMI may be enhanced through focused analysis of key steps within the care process to identify system problems and implement quality improvement initiatives. Van de Werf F, Bax J, Betriu A, Blomstrom-Lundqvist C, Crea F, Falk V, et al. Management of acute myocardial infarction in patients presenting with persistent STsegment elevation: The Task Force on the management of STsegment elevation acute myocardial infarction of the European Society of Cardiology. Eur Heart J 2008;29:2909-45. Steg PG, Bonnefoy E, Chabaud S, Lapostolle F, Dubien PY, Cristofini P, et al. Impact of time to treatment on mortality after prehospital fibrinolysis or primary angioplasty: Data from the CAPTIM randomized clinical trial. Circulation 2003;108:2851-6. Mahdhaoui A, Bouraoui H, Majdoub MA, Ben abdelaziz A, Trimech B, Zaaraoui J, et al. Delays in the management of AMI: Results of an investigation conducted in sousse (tunisia). Ann Cardiol Angiol (Paris) 2003;52:15-9. Canadian Cardiovascular Society; American Academy of Family Physicians; American College of Cardiology; American Heart Association, Antman EM, Hand M, et al. 2007 Focused update of the ACC/AHA guidelines for the management of patients with ST-elevation myocardial infarction. A report of the American College of Cardiology/American Heart Association Task Force on Practice Guidelines. J Am Coll Cardiol 2008;51:210-47. Antman EM. Time is muscle: translation into practice. J Am Coll Cardiol 2008;52:1216-21. Schiele F, Hochadel M, Tubaro M, Meneveau N, Wojakowski W, Gierlotka M, et al. Reperfusion strategy in Europe: Temporal trends in performance measures for reperfusion therapy in ST-elevation myocardial infarction. Eur Heart J 2010;31:2614-24. Glickman SW, Cairns CB, Chen AY, Peterson ED, Roe MT. Delays in fibrinolysis as primary reperfusion therapy for acute ST-segment elevation myocardial infarction. Am Heart J 2010;159:998-1004.e2. Rajagopalan RE, Chandrasekaran S, Pai M, Rajaram R, Mahendran S. Pre-hospital delay in acute myocardial infarction in an urban Indian hospital: A prospective study. Natl Med J India 2001;14:8-12. Rathore SS, Epstein AJ, Nallamothu BK, Krumholz HM. Regionalization of ST-segment elevation acute coronary syndromes care: Putting a national policy in proper perspective. J Am Coll Cardiol 2006;47:1346-9. Ting HH, Bradley EH, Wang Y, Nallamothu BK, Gersh BJ, Roger VL, et al. Delay in presentation and reperfusion therapy in ST-elevation myocardial infarction. Am J Med 2008;121:316-23.